Readership has been up here at The Virginia Conservative these last several months. In fact, November places first in overall visits per month with October clocking in at third behind January 2010. Even though December is not over yet, it too is shaping up to be another well-read month. Now you may have noticed that lately, I’ve been exploring a variety of ways to expand my audience. After all, the more people you reach, the greater chance you have to make some sort of meaningful difference. Well, yesterday afternoon marked my first appearance on the radio. For those of you in the Charlottesville listening area, you might have caught me on The Schilling Show. The show airs on 1070 AM WINA every weekday from Noon until 2 PM. On this program, Rob Schilling, his guests, and his callers discuss numerous political and religious issues, as well as local topics of importance to the Charlottesville community. Although you can also tune in to the program on the radio here in the Valley, reception is spotty due to the inference caused by the Blue Ridge Mountains. Over all, I thought my performance went well. Although, I’ll freely admit that pretty nervous before we started, I must say that I really enjoyed my time on the air. I wish that I would’ve had a bit more time, as there were several important issues I would have loved to discussed, but I guess I’ll have to save them for another day. As they say, time flies when you’re having fun! If you are interested in hearing my segment, you can find in on the podcast section found here. Just scroll down the page until you find my name and simply click on the playback format you prefer. I want to say thank you again to Mr. Schilling for letting me come on his program and I hope that those of you unfamiliar with his work will take the opportunity to check out his show. Although I don’t know the next time or place, I’m really looking forward to my next spot on the radio. Maybe you’ll be able to tune in. At the height of the Cold War, fears over fluoridation triggered a series of chain reactions that could have ultimately led to the thermonuclear destruction of, not just the United States and the Soviet Union, but the entirety of civilization. What? You don’t remember that story from your history class? Well that’s because it isn’t part of the historical record, but rather the plot of the black comedy Dr. Strangelove. General Jack D. Ripper, the commander of a U.S. airbase, supposedly discovers that fluoridation of our water and other foods is part a massive Soviet conspiracy to weaken and control the American populace. As he puts it, “I can no longer sit back and allow Communist infiltration, Communist indoctrination, Communist subversion and the international Communist conspiracy to sap and impurify all of our precious bodily fluids.” Although it should be well beyond his command capabilities, Ripper then launches a full-scale nuclear assault against the Soviets. Thus the remainder of the movie becomes a race against time as the bumbling President of the United States, the intoxicated Soviet Premier, the mysterious and insane Dr. Strangelove, and the incompetent military brass try to stop this attack before humanity is completely wiped clean from the world. Obviously, most rational people would quickly dismiss General Ripper’s bizarre claims as delusional paranoia. But should they? Recent studies by the National Institute of Environmental Health Sciences and other organizations show that Ripper might be right. No, they are not claiming that the Soviets have tainted our water supply, but rather water fluoridation might be detrimental to our health. As I understand it, the fluoridation process began many decades ago as an attempt to improve dental care. Unfortunately, this new report indicates that fluoridation creates an extremely negative drawback among developing children. Supposedly, prolonged consumption of this modified water can result in lower IQ scores and even an increased risk of mental retardation. Although I strongly encourage you to read the entire article found here, as Dr. Tara Blank writes, “This should be the study that finally ends water fluoridation. Millions of American children are being exposed unnecessarily to this neurotoxin on a daily basis. Who in their right minds would risk lowering their child’s intelligence in order to reduce a small amount of tooth decay, for which the evidence is very weak?” In addition, according to the EPA, overdosing on fluoride can pose health risks such as bone disease, bone pain, or bone tenderness. Personally, I have been opposed to fluoridation for some time now for two separate reasons not related to health concerns. The most important one is that I object to the idea of adding any chemical to public drinking water without the consent (and quite often the knowledge) of the people who consume it. Any citizen of a modern nation should be able to enjoy clean and safe water from his or her faucet without worrying what chemicals or contaminants are dissolved within it. An individual is the best person to decide the contents of his or her drinking water, not bureaucrats and politicians. As with vitamins, one could argue that the government has the authority to suggest appropriate fluoride levels, but the private citizen should determine what amount, if any, is best for him or herself. The second reason is merely cosmetic. Having ingested considerable sums of fluoridated water during my youth, I now suffer from a very mild case of dental fluorosis; white streaks or spots on my teeth. I cannot speak about modification in my IQ for obviously any change in my mental development as a result of fluoridation is completely unknown. I will readily admit that the character of General Ripper is an unbalanced psychopath and the idea of ending water fluoridation may sound like crackpot rubbish at first, but it is an issue that we should explore. I don’t know about you, but I’d much rather have a community of greater cavities and false teeth than one marked by a noticeable decrease in mental capacity. If the studies are indeed correct, we must end fluoridation, and we must end it as soon as possible. But even if fluoridation poses no serious risk, I still maintain that its inclusion in drinking water ought to be a personal choice. Now I’m certainly not a conspiracy theorist and I confess that I need to learn more myself. Nevertheless, I recommend that you read the evidence both for the process and against and see what you think. You should watch Dr. Strangelove when you get the chance for it is a brilliant film; however you shouldn’t dismiss questioning of fluoridation simply due to their association with Ripper’s mad ramblings. Special thanks to Brian for sending me the link. Well everyone, Christmas is nearly upon us. In celebration of the holiday (or simply due to the fact that I finally got around to it), I’ve uploaded a bunch of new pictures. They include items from the Ron Paul Campaign (2007-2008), the Hamilton Campaign (2009), and Monday’s trip to Richmond. But where can you find this expanding library of images? Why on The Virginia Conservative Facebook page! Speaking of Richmond, they have a new display at the General Assembly building called “The Struggle to Decide” commemorating the 150th anniversary of the secession crisis which ultimately resulted in Virginia’s withdrawal from the Union. The Library of Virginia has a related exhibit. As much has been forgotten or neglected, I believe we should take a moment to reflect upon the past. Although you may be unaware, after seven states had already seceded, Virginia originally rejected secession by a convincing margin on April 4th of 1861. Once Confederate forces captured Fort Sumter, President Lincoln called for troops to crush the rebellion in the deep Southern states on April 15th but Virginia’s Governor refused to take up arms against them. 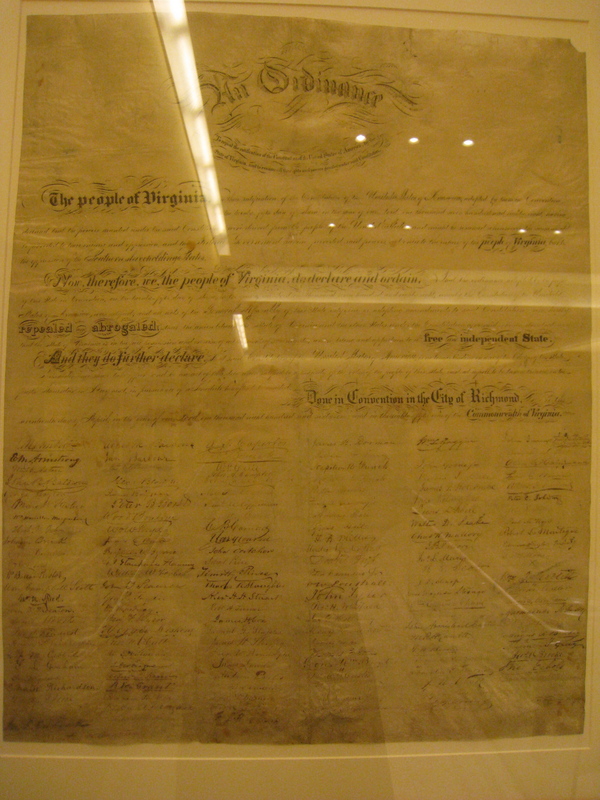 Two days later, the Virginia convention voted again, this time to secede and adopted the Ordinance of Secession, declaring Virginia to be a “free and independent state”. On May 23, voters gave their stamp of approval to secession and the rest, as they say, is history. I expect that I’ll write more about this issue once I’ve had a chance to explore both exhibitions. You should check it out for yourself. It runs from now until October 29, 2011. Lastly, as many of you are new to this site, I want to direct your attention to a post that I wrote two years ago on the timely subject of Christmas and Santa. Unfortunately, although most households will recite the whole Santa story as if it were enshrined as a scriptural canon, I highly recommend a differing approach based upon the truth. And so, even if I have to stand alone, I will continue “My War Against Santa“. Thanks for reading and I hope you have a very merry Christmas. Yesterday, the “Dream Act” died…at least for now. Fortunately, supporters of illegal immigration were unable to muster the necessary sixty votes in the U.S. Senate. Although it seems obvious to me, if you wish to discourage a behavior, like illegal immigration, shouldn’t you reject potential policies that will likely result in a greater influx of undocumented aliens? After all, did the last amnesty as granted in the Immigration Reform and Control Act of 1986 solve our immigration problem? Or did it only give confidence to millions and millions more to flood across the border in the hopes of gaining similar treatment at some point in the future? A little bit ago, I received this email from former Senator and Governor George Allen regarding his opinion on the matter. When the government rewards illegal behavior, we will get more illegal behavior. “If the government rewards illegal behavior, we will encourage more illegal behavior. The so-called “Dream Act” being pushed by Washington liberals like Speaker Nancy Pelosi, Leader Harry Reid, and Senators Durbin and Kerry is a flawed piece of legislation that rewards illegal behavior with benefits paid for by taxpayers. It is unfortunate that Senator Jim Webb chose to put the political interests of his liberal colleagues before the valid concerns of Virginians. “As the son of a legal immigrant, I believe in the American dream where immigrants legally come to these shores to seek religious, economic and political freedom. I strongly oppose rewarding illegal behavior through amnesty and believe our first priority needs to be securing our borders. Thank you for sharing your thoughts Mr. Allen. Although I have not gotten behind a candidate for Senate yet, I strongly believe that Virginia needs a Senator who will protect our borders, defend our laws, and not reward illegal behavior. I think we all can agree that Jim Webb is not such a Senator. Thankfully, in less than a year Virginians will have the chance to replace him. So Much For Religious Freedom? You know, I was under the impression that citizens and businesses were allowed at least some measure of religious freedom. After all, along with the freedom of speech and the press, isn’t that one of the primary purposes of the 1st Amendment? Well, according to our unelected masters at the Federal Reserve, that right can be revoked. Until late last week, a small bank in Perkins, Oklahoma displayed crosses, had a Bible verse on their website, and their tellers wore “Merry Christmas” buttons without any reported trouble. However, having learned of this religious display, the Fed stepped in to trample upon the freedoms of the bank. Worried that all of this imagery and holiday cheer would offend someone, it had to go. Now, I believe that any person should have the freedom to express their religious beliefs as they see fit (assuming, of course, it doesn’t hamper the liberty of another). If a bank wishes to display a cross, a menorah, a crescent moon, or a statue of Shiva, isn’t that their right? Concurrently, whether they choose to celebrate (or not to celebrate) Christmas, Hanukkah, Kwanzaa, or anything else, shouldn’t they be allowed to? If I don’t care for their display, as a customer, I am free to take my business elsewhere. Is your faith (or lack there of) so weak that even the smallest of mention of a contrary opinion is damaging? Do we live in a land of religious freedom and toleration…or a land forcibly wiped clean of religion, especially Christianity? Fortunately, after considerable public demand, the Fed countermanded their original orders…at least for the moment. I wish I could say that the issue has been resolved permanently, but such a claim would be extremely naïve. This incident further illustrates that in the mad scramble for political correctness and overreaching government control, our rights can be quickly swept away if we are not constantly vigilant and willing to stand up for them. I’d like to leave you with one question. Would the Fed had acted in the same manner if the displays were Jewish or Hindu instead of Christian? I really doubt it. I want to send out thanks to the Shenandoah Valley Tea Party for bringing up this issue. The original stories from the KOCO News of Oklahoma City can be found here and here. Joshua’s Note: I recently received an email from a citizen of Fairfax County regarding some of the shady dealings of the local school board. Although I’m not a resident of the area, I strongly support the idea of government openness and accountability. As indicated at the bottom of this post, this special guest letter is written by Lin-Dai Kendall. I hope this letter will help foster discussion on this issue. I’m a resident of Fairfax County. Given that it’s lauded as among the best run, among the wealthiest, priding itself in the service provided to its residents, I am totally taken aback at the questionable behavior of some members of the School Board in regards to the future of our community schools. It is neither an emotional reaction nor an emotional issue. The county’s taxpayer base owns the schools they let the SB run and therefore a sense of school ownership by the taxpayer is only appropriate. The issue at hand, how does a School Board allow and tolerate the unethical behavior of a member of its cadre is begging to be addressed. What is happening to our communities, our governance, that so many people can witness breach of public trust and arrogantly turn their backs hiding in a curtain of fabricated, limited & skewed information and behind the skirts of sympathetic politicians? Allowing a member to deliberately obscure the truth, insist in rationalizing and justifying a vote rooted on deceit before Fairfax County’s citizenry can only be categorized as appalling and demoralizing. This comment is not a shot in the dark nor does it qualify as irresponsible. The incongruence of a vote to close a Governor’s Award of Excellence community school vis-à-vis the solutions presented in the Southwestern Regional Planning Study as well as the information provided in multiple hearings raised suspicions of an agenda behind an agenda. Subsequently members of two strong education/schools advocacy groups submitted FOIA requests to gain a better understanding of the most recent decisions of our School Board and FCPS. (FOIA requests have been posted for public consumption by these advocacy groups.) The information reviewed clearly shows SB rep. Liz Bradsher coaching a larger segment of her constituents from West Springfield H.S., on how to advance their center to the head of the renovation queue at the expense of closure of Clifton Elementary School (thus a smaller segment of voters). You decide how to qualify her actions. An informed public with the responsibility and power to vote can and WILL take care of this situation. Let FCPS know that they as well as the School Board work for US, the Fairfax Resident. A boundary study that will affect 23 schools and 18,000 children cannot and should not be spearheaded by anyone who’s INTERESTS COME BEFORE THOSE OF ALL HER CONSTITUENTS, or demonstrates a lack of integrity. Such an individual needs to be removed from his/her representative position and prevented from having anything to do w/ facilities planning. I also urge you to ask of your favorite news outlets to shed light on the truth. Media outlets and political blogs everywhere have been buzzing about Virginia’s Attorney General Ken Cuccinelli since Monday’s court ruling striking down the heart of Obamacare as unconstitutional. Although such news may come as a shock to some liberals, like the judge in the case, I think it is quite clear that the United States Constitution does not give the federal government the authority to force citizens to buy anything, let alone health insurance. But, as there is already an overabundance of discussion on this topic, I’d like to switch gears. Ken Cuccinelli has made quite a name for himself both in Virginia politics and nationally, first in our State Senate and now in our Attorney General’s office. He has proven, through both his words and his deeds, that he is an ardent and effective conservative, a champion of the 10th Amendment, and a defender of liberty. But one question constantly nagged me. What office would Cuccinelli seek next? Would he run for the U.S. Senate in 2012? After all, the potential field is already getting crowded. Perhaps he would make a move to join the ranks of men like Patrick Henry, Thomas Jefferson, and James Monroe, becoming the next Governor of the Old Dominion? Doing so would likely set up a showdown between himself and Bill Bolling. Through recent statements, the Attorney General has left this potential door available. Although I believe Cuccinelli could prevail, it could also set up a very ugly nomination contest. I assume that many of us recall the feud between then Lt. Governor John Hager and AG Mark Earley that led to the victory of Mark Warner. Still other pundits suggest that Cuccinelli should run for re-election to his current post. Then again, given his increasing national attention, would an attempt to become the next Vice President or even President seem too far-fetched? Well, about two hours ago, it seems that question has been finally answered. Well, the liberals sure didn’t waste any time. After news came out yesterday that a federal judge here in Virginia sided AGAINST President Obama and in favor of my argument that the federal government’s mandate to require you to purchase health insurance is unconstitutional, the liberals quickly began launching their attacks at us. And they are coming after us with everything they’ve got. So I’ll keep this short and sweet. We are in for a long fight in this case that is certain to be decided by the Supreme Court. And even though I strongly disagreed with the healthcare bill, our ongoing lawsuit isn’t about healthcare. It’s about liberty! It’s no secret — I’m not the most popular person with liberals in America these days. The conservative leadership I’ve been working to provide in Virginia and across the country has drawn countless personal and political attacks from the left. I’m encouraged that so many pro-freedom Americans – here in Virginia and across the country – have supported my efforts to stand up for our Constitutional rights. But the flip side is that my political opponents are more determined than ever to smear me over the next 3 years and then defeat me when I’m next up for election. That’s why I can’t just sit back and allow the left’s attacks on me to go unchallenged. And that’s why I can’t wait to gather the resources to fight back – so please help me by making a donation today! 1. To give me the resources to respond when my political opponents attack me for doing my job … protecting Constitutional rights. 2. Our side needs leadership now more than ever. I’m trying to provide that leadership in Virginia and nationally. Your donation will allow me to travel to provide leadership and campaign for good constitutional conservative candidates. We must increase the number of elected officials – at all levels of government – who will stand up for limited Constitutional government. 3. And I must start building up my campaign warchest now in order to be ready for whatever the liberals throw against me when I run for re-election. So please, make a donation right now to help me fight back TODAY by clicking here! Make a donation right now! Did you catch the answer? “…When I run for re-election”? So Ken Cuccinelli hopes to serve as our Attorney General for eight years? Great! I’m all for it. Given his popularity, massive name ID, and the fact that Virginia hasn’t elected a Democratic Attorney General since Mary Sue Terry in 1989, barring any major setback, Cuccinelli should be a virtual lock for re-election three years from now. Virginia and the nation need strong leaders who will stand for principle over petty political maneuvering and personal gain. Conservatives must be bold and resolute, always defending our values and not caving in to the demands of “more government” simply because it is the easiest path. As long as Ken Cuccinelli represents these ideals, I will proudly stand beside him, whatever office he may hold and encourage like-minded Virginians to do likewise. KC 4 AG 2013! As part of my study of political philosophy while at William & Mary, we read a few of the works of Niccolo Machiavelli. Although The Prince is his best-known treatise, you should know that Machiavelli was a man of many talents; he was also a poet and a playwright. Sunday evening, I reread his play Mandragola. Much like his philosophical work, Mandragola is infused with deeper meanings and revelations about mankind. Unfortunately Mandragola is a depressing tale. None of the characters in his play are moral; each is scheming for some personal gain at the expense of his or her neighbors or relatives. For example, the main character, Callimaco lusts after the wife of an older man of Florence. In order to achieve his goal, he devises an elaborate scheme to trick Nicia, the old fellow, into willingly opening his bedchamber to Callimaco’s interloping. Nicia, who desires offspring more than anything else, assumes he is sacrificing the life of an innocent bystander in order to gain a child. Timoteo, a priest of the city, goes along with any devious plan if at the end of it he will make financial gains. Lucrezia, Nicia’s wife, while originally seeming virtuous, secretly breaks her marriage vows for the sake of her new lover. Although each character puts forth a seemingly honorable face with the best of intentions toward those they are trying to deceive, we, as the audience who have heard their inner thoughts, know their true wickedness. As I believe was the case with The Prince, Machiavelli weaves this tale not to say this is necessarily how people should act, but rather, when left to their own devices, this is how people will act. Another common thread with The Prince is the underlying theme that fortune favors the bold. Consider again the character Callimaco. Rather than sit around moping about the love that can never be his, he instead acts quickly and decisively to acquire the object of his affection. Thus, those who are daring are far more likely to achieve their objectives than those who act timidly. Obviously, as a social conservative, I cannot condone his actions, but they do serve some practical value mostly as a warning. One should never simply assume that humans would always act in the spirit of charity, honesty, and virtue. To blindly assume nobility of your comrades and associates is a recipe for your own disaster. Although all areas of human interaction can fall prey to this callous dishonesty, they are typically most frequent and recognizable in the areas of politics and religion, which I believe Machiavelli knew all too well. This work plumbs the dark recesses of the human soul. Personally, I have witnessed many cases of one person crushing another beneath his or her feet in order to achieve wealth, status, power, or the attentions of another. The temptation is always present, always gnawing at the corners of your soul. I wonder how many folks, while in midstep, look down and recoil in horror at the act which they have willing committed, the person on whom they have trampled in the quest for personal glory. I suppose each step that one takes makes the following one that much easier. Mandragola can be viewed in many differing lights. It can be a grim caution against deception, a manual on how to succeed no matter the cost, or a woeful tale of the greed and corruption of society and the church. Read the play and decide for yourself. Although compared to the works of Shakespeare, it is exceedingly brief, but a careful reader can draw much from its pages. No doubt that The Prince is a far more valuable work in terms of political philosophy; nevertheless, for all of the reasons stated above, once you have exhausted that text, I encourage you to take the hour or so needed to explore Machiavelli’s Mandragola. Despite being a New York Giants fan, I have often jokingly stated that there is very little to like about New Jersey, especially when it comes to New Jersey politicians. Given the traditionally moderate to exceedingly liberal nature of the state, coupled with regular cries of corruption, it is not difficult to understand why conservatives would frown upon New Jersey politics. As an infrequent visitor to the state, I’m appalled by the vast number of toll roads and the fact that one is forced to pay someone else to fill up your gas tank. Although fairly recently elected Governor Chris Christie has captured the hearts and hopes of a few conservatives I know, might I suggest you take a closer look at another New Jersey leader? 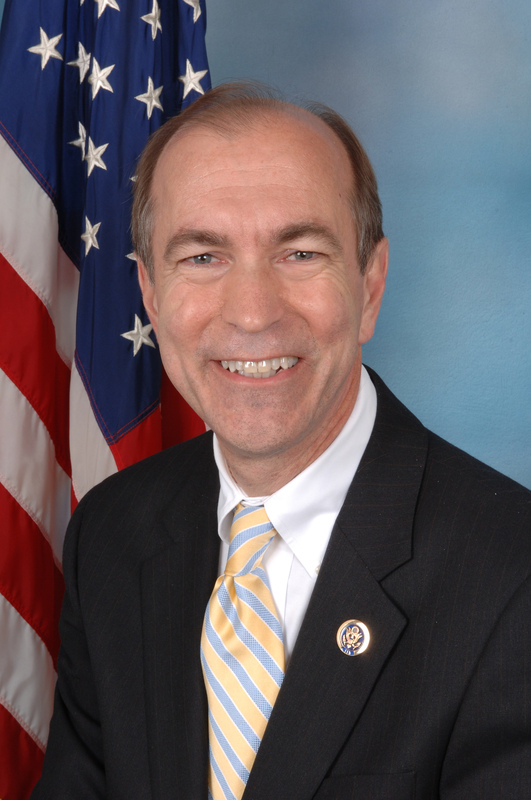 Just north and west of East Rutherford (where the Giants play), you will find New Jersey’s fifth congressional district, home to Representative Scott Garrett. But that’s not all. In yesterday’s Washington Times, we learn that Representative Garrett just sponsored a bill that would require each piece of congressional legislation to cite where in the Constitution such action is authorized. For an ardent 10th Amendment supporter like myself, I eagerly welcome such legislation. Only by obeying the restrictions set forth in Constitution will we ever hope to restrain the increasingly grotesque power expansion in Washington. Assuming that the Republican leadership takes the words of their A Pledge to America seriously, they should stand behind Garrett’s efforts. After all, the pledge states, “We pledge to honor the Constitution as constructed by its framers and honor the original intent of those precepts that have been consistently ignored – particularly the Tenth Amendment, which grants that all powers not delegated to the United States by the Constitution, nor prohibited by it to the states, are reserved to the states respectively, or to the people.” I would recommend that you write your Representative to encourage him or her to support this effort. Although he did not become the next Speaker of the House as I suggested in my article from November 3, 2010, I strongly believe that Representative Garrett is a man who deserves support and recognition, especially from like-minded activists. Take a look and I’m sure that you will agree. Once you do, “like” him on Facebook so you can keep tabs on his efforts. As a final thought, given that only one of my Facebook friends currently likes Rep. Scott Garrett, I do have to wonder if the rest of my friends have taken the time to discover this New Jersey conservative. Don’t you think you should? I arrived at the library a few minutes after 6:00 PM but was dismayed to discover that the close parking lots were full. Therefore, I had to park on the next block away. Normally this setback wouldn’t be too troubling but, given that I had to haul multiple heavy items such as two gallons of tea, two gallons of water, and several boxes of cookies, I found the multiple treks to and from my car to be quite taxing. The first guest to arrive was Mr. Mellott, a writer for the Daily News Record. I was pretty surprised to see him because I didn’t think the local news would take much notice of my humble operation. His presence made me a bit nervous, not because I have any objection to attention from the media, in fact I welcome it, but rather I was worried that the event would be sparsely attended and therefore reflect poorly on me. Next to arrive was a handful of members of the Shenandoah Valley Tea Party. Although they too were not in my expected age range, I greatly appreciated their company especially their willingness to help me set up the room and return the items to my car upon the conclusion of the event. All in all, about twenty people showed up to the gathering. We had a handful of people from the Young Republicans, the James Madison University College Republicans, Luis (a great guy who is very spirited about the cause), and even a few volunteers from Corey Stewart’s The Rule of Law Campaign. Even though I had prepared a few brief remarks for the crowd, I never had the opportunity to speak given that people came and went as they pleased. I don’t believe that more than ten people were in the room in any given moment. Then again, perhaps it was for the best. After all, the event wasn’t for me, but for everyone. Overall, the meeting was both a disappointment and a success. It was a disappointment because, with the exception a few of the JMU CRs, I didn’t get to meet any new 18 to 40 year old conservatives. I didn’t bring in any new blood. By contrast, my unexpected accomplishment was the opportunity to spend a good bit of one-on-one time talking to the leaders of the local Tea Party. Although, in general, they are both considerably older than I and don’t have nearly the experience in politics, it is refreshing to hear about and witness their dedication and vigor in support of our shared conservative principles. Let me take the opportunity to infuse this post with a bit of political encouragement. Don’t believe the lies. One person can make a difference in politics, regardless of age or experience. You are not alone. Never forgot that there are many conservatives, just like you, out toiling in the trenches to promote our ideology. But you should join a group. Whether it is the College Republicans, Young Republicans, City or County Republicans, your local Tea Party, or something else, find activists who believe the same as yourself. After all, while one person can carry away heavy stones, a multitude can move an entire mountain. I guess in retrospect, I should have expanded my invitation for the event to conservatives of all ages. It just would be nice to meet a few more unattached conservative young women. Anyway, next time I hold a social event, I really hope you can join me.